Blades made of glass, unusual crescent-shaped tools, and a dagger formed by shadows are some of the more striking finds reported this year by archaeologists working around the American West. Together these discoveries comprise just a tiny slice of the research that was done this year, at countless sites from the Great Plains to the Pacific Ocean. Some of these finds were made in the field, others in labs; some were made by academics, still more by anthropologists working at private firms. Western Digs reported on dozens of different studies in 2016, but a handful of the ones that we told you about rose to the top, capturing your attention as the most popular archaeological discoveries of the year. To those of you who are frequent Western Digs readers, a few of these discoveries may already be familiar. And if you’re new to the community, then welcome! There’s no better time to learn about the past than the present. One of the most popular discoveries we reported on this year was a Western Digs exclusive: new revelations about the full extent — and expertise — of the rock art found among the isolated mesas of Arizona‘s Wupatki National Monument. Led by researchers from the Museum of Northern Arizona, archaeologists recorded more than 1,500 petroglyphs, including hundreds that had never been recorded before. Some of the glyphs were made as recently as the late 19th century, while others are typical of rock art from the so-called Late Archaic period, which dates back as much as 4,000 years. But the most impressive discovery by far was an intricate Ancestral Puebloan solar calendar, which uses the changing angle of the sun’s rays throughout the year to create a “shadow dagger” during certain celestial events. At these times, the dagger interacts with meticulously carved petroglyphs to mark the winter solstice and the spring and fall equinoxes. Learn all about these newly recorded pieces of rock art, how they were discovered and recorded, and what they reveal about the lifeways of the Ancestral Puebloans. And be sure to see our exclusive photo gallery of the solar calendar at key days of the year. Some of the oldest signs of human occupation on the continent can be found on the Channel Islands of southern California. And this spring, researchers reported some of the earliest evidence yet of human presence on the California coast. On Santa Cruz Island, the largest of the Channel Islands, researchers found three tool-making sites, two of which appear to be as much as 11,000 to 12,000 years old. The artifacts found there — including flakes, stone cores, and a number of curious, crescent-shaped tools — are traces of the Island Paleocoastal culture, a seafaring people descended from migrants who moved south from Alaska along the Pacific at the end of the last Ice Age. Explore the island and read more about the rich, millennia-long history of some of southern California’s earliest inhabitants. Of all of the marks that people have made on the American West through the eons, some of the rarest — and most fascinating — are fossil footprints. Last winter, archaeologists surveying a swath of suburban Tucson, Arizona for a road project made an unusual find: dozens of footprints that had been preserved in a patch of muddy hardpan soil for 2,500 years. The prints criss-cross what appears to have been an irrigated field, evidence of some of the Southwest’s first farming, during what archaeologists call the Early Agricultural period. Among the tracks are a series of prints made by an adult male, a child, and a dog. See the site of the oldest known human footprints in the Southwest, and hear what archaeologists had to say when they made the find. One of the more intriguing kinds of archaeological finds is the cache: a collection of objects that have been intentionally stashed, oftentimes hidden, for later use. Caches provide a rare opportunity to study a large number of artifacts in the same context, allowing anthropologists to compare how items were variously made and used. And not long ago, an Oregon scientist made just such a discovery, literally in his own back yard. 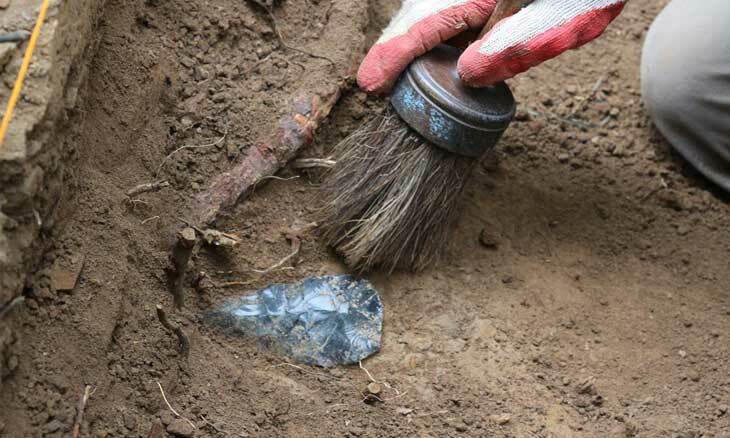 This summer, researchers reported the discovery of a large cache of thousand-year-old blades, made from obsidian glass found on the man’s property in the Willamette Valley. And there was something unusual about these blades: They were unfinished. Archaeologists believe the cache reveals just one step of an ancient trade network, where semi-finished goods were transported to be swapped for other materials. See where the thousand-year-old tools were found, and find out what they can tell us about trade and travel in the pre-contact Northwest. Perhaps it’s not surprising, but this year’s most-read-about archaeological find strikes deep at the heart of one of American archaeology’s most enduring controversies: Was Clovis really the continent’s first culture? A discovery that’s still unfolding in Texas suggests it wasn’t. Just north of Austin, archaeologists have found evidence of human occupation dating back up to 16,700 years — 3,000 years older than the oldest known Clovis sites — including fragments of human teeth and more than 90 stone tools. Known as the Gault site, the location is famous for its rich inventory of distinctive stone tools that are indicative of the Clovis culture. But recently, researchers dug deeper and found more, even older tools, some fashioned in styles that are very different from, if somewhat reminiscent of, Clovis techniques. Explore the Gault site, and learn about the latest insights into what may prove to be the oldest artifacts yet found in the American West. Our sincere thanks go out to all of the hundreds of thousands of readers who made these stories the most-read Western Digs articles of 2016. Here’s looking forward to an even more enlightening 2017.